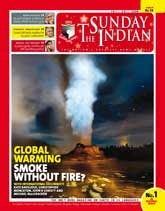 The cover story “Global warming… fire?”** and the edit “The UN Copenhagen…”*** (TSI, Dec 14-20) made a serious read. At present, developed countries like US and others are on the top list in gas emissions but their percentage in cutting down the emissions is very low as compared to India and China. We need to think seriously to save our coming generations. We need to take an initiative to control this global phenomenon. If we continued our present life style then we all will get caught in this peril. Global warming is a serious threat to all species on this earth. The scientists have already warned that the world has just 10 years to reverse the surging greenhouse gas emissions otherwise climate change would make this planet uninhabitable. They conclude that unless mankind stabilizes greenhouse gas emissions and start reducing them, it will have little chance of keeping global warming within manageable limits. We seriously need to think and act accordingly to reduce the emissions. We must stop cutting down the trees otherwise they will damage the already perishing flora and fauna of our country. As for creating awareness, schools and colleges can play an important role. Let’s pledge to plant more saplings in our surroundings and other places available. Our Planet Earth We are Living in is not well, and its health is day by day deteriorating.